Select World Service (SWS) delivers exclusive CxO dinners in any city around the globe, both in local language as well as English for an exchange of ideas with your peers at a very senior level. Our CxO dinners offer a unique experience for our executive guests as each dinner is created to promote senior level peer-to-peer interaction, brainstorming of ideas and trends within the participants’ specific area of expertise, therefore, creating extensive value for our guests. The CxO dinners are by invitation-only to ensure quality and balance for each executive dinner. The dinners comprise of senior leaders from private and public companies and participation is always free of charge. Each event audience selection is based on the participants’ relevance and influence within their respective organizations and will be limited to a specific number of executives. 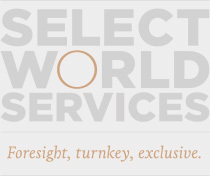 If you are interested in receiving invitations to our exclusive dinners around the globe, please send an email to Registration@selectworldservices.com or you can select an event and register. Please note that your confirmation of the event shall only be confirmed once the request is vetted and SWS sends an official confirmation email. Select World Services (SWS) would love to hear from you. If you would like to learn more about our Global Event Services, please send us a message. © 2017 SWS - Select World Services. All rights reserved.